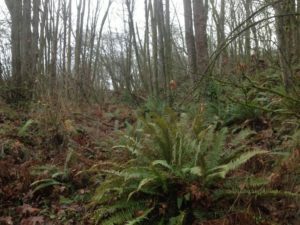 The West Duwamish Greenbelt Trails group advocates for and supports trails in Seattle’s largest contiguous forest, which is located on a ridge above the Duwamish Waterway in West Seattle. I wrote this article for the group’s website. 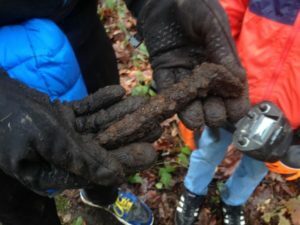 For an eleven-year-old boy, the fun is using a metal detector to find old railroad spikes. For his father, it’s discovering the railroad grade he can feel with his feet and see as an opening in the woods. For me, it’s the history. 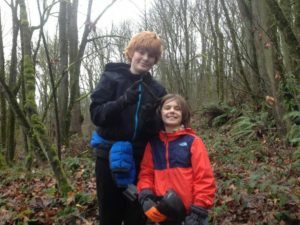 We went looking for all three on a sunny winter day in the West Duwamish Greenbelt, the largest contiguous urban forest in Seattle. This is Craig Rankin’s backyard. He has hiked the trails, biked some, trimmed dead branches threatening the paths, and volunteered for work parties on countless weekends. His passion is finding the path that has been obscured. That would be the grade of the Highland Park & Lake Burien Railroad which brought prospective home buyers to land southwest of Seattle. In 1912 the large unincorporated area was still farmland; stands of timber and woods teemed with wildlife that appealed to hunters. But real estate developers like George W.H. White envisioned streetcar suburbs–Highland Park, White Center, Oak Park, Seahurst, Sunnydale, Lake Burien, Gregory Heights, Three Three Point, and Burien. All buyers needed was an easy way to get there. The fourteen-mile route began at the West Seattle Junction in the community of Riverside near the tideflats of the Duwamish River. There three streetcar lines from the west converged to head over a trestle to downtown Seattle. The Highland Park and Burien route headed south, behind businesses along the Duwamish River. After traversing the hillside that slopes down from South Seattle College and the Riverview playfields, the route crossed Highland Park Way and continued south to the end of the line in Burien. The electric streetcars ran until the early 1930s when landslides, financial challenges, and competition from roads made them unviable. The tracks and power lines were ripped out; trees fell over the path, landslides continued, and blackberry vines crept over the gravel roadbed. Although many have speculated, the streetcar’s precise route through the greenbelt, has been a mystery. Landslides in 1912 and 1933 interrupted service on the route for several months and have further altered the terrain since then. Rankin studied old maps and photographs of sidings, tracks, and stations and set out to find the grade he knew was there. He brought along his eleven-year old son Hagen, Hagen’s friend Jackson, Jackson‘s father Mark, and a metal detector. The proof of the route would be railroad spikes. Following a hunch, Rankin started down an old road that carried trucks to and from a sand and gravel operation at the top of the ridge. About halfway down Rankin spotted what looked like a break in the east-west ridge on the north side of the road. That notch looked like a cut for the railroad line. Climbing down from the old road and bushwhacking carefully through dense vegetation, the explorers crossed a stream and followed a faint path through the second-growth woods–past a discarded suitcase, a rain-soaked sleeping pad, and a backpack buried under the leaves. Part of a thick wooden post leaned on the ground with the word “Swain” partially visible. 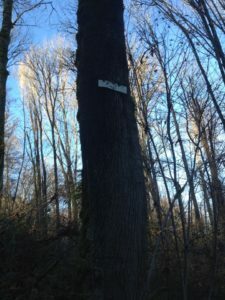 (Nature Consortium placed markers in the forest for the migratory birds that pass through, including Swainson’s Thrush.) A curious roll of barbed wire around remnants of a wooden barrel was half-buried in the mud and leaves. Then—along the trampled pathway–the clink of metal. Hagen and Jackson started digging. 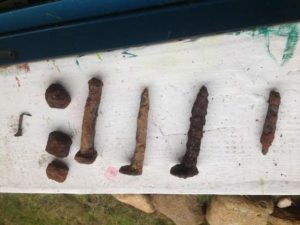 In three places, they found iron spikes, shorter than those on a long-haul route like the Milwaukee Road. The spikes provided clear evidence of the railroad’s route. On a follow-up adventure, Craig, Hagen and I bushwhacked a bit farther on the path we could see winding through the trees.By then Rankin had unearthed a King County survey map showing the route of an “abandoned street railway” right where the spikes were found. We were soon blocked by a downed tree and blackberry vines, saving more exploration for another day. Again following the lay of the land, we decided to head uphill instead of back the way we had come. We soon realized we were hiking an old road up toward the top of the ridge. Then—a tin sign on a tree—Clinker Hill Road. Who could have expected a sign? Clinker is the waste produced from industrial processes such as smelting or cement production. After the streetcar line was taken out, much of the land on the ridge was mined for sand and gravel (sand is clearly visible in streambeds). In the 1970s the Ideal Cement Company dumped cement kiln dust waste on property at the northern end of the greenbelt. That legacy of pollution has complicated the construction of north-south trails. There are more mysteries to be unraveled: Where were the two sidings that appear on railroad maps: the Schoolhouse Siding (which must have been near the old Riverside School which opened in 1888 at Detroit Avenue and W. Juneau Street) and the Michigan Siding? What are the small rectangular pieces of iron the boys found? What was the bale of barbed wire? What type of vehicle did that narrower gauge tire come from [photo]? What happened to the power poles? Where did the streetcar route exit onto West Marginal Way? For more information, see Mark Bergman’s talk on the Highland Park & Lake Burien Railway in the Southwest Stories series sponsored by the Southwest Seattle Historical Society.